Since 1995, DR Instruments has been designing and manufacturing quality yet affordable dissecting kit items for use by students and teachers all over the World. We understand the needs of science students and educators. We have designed a full line of dissecting instruments for studies in anatomy, zoology, botany and biology. DR Instruments is a direct source for dissecting instruments and dissecting tools (dissecting kit items, scissors, forceps, scalpel blades, dissecting probes, and more instruments ) for classroom use. These dissection kits make classroom dissection easy and convenient for our students and teachers, including premium scalpel blades that last and additional instruments to give students the insight they need. Well designed dissection tools direct from the manufacturer mean a quality educational experience and great savings. You will find dissecting tools appropriate for all levels of education – junior and senior high, college, and graduate school students – and ideal for public and private schools and even homeschooling families. Help is also available for homeschooling parents in choosing the right dissection tools, microscopes and specimens for their children’s coursework. Are you a teacher with unique needs? Contact us, and we’ll be happy to prepare custom dissection kits for your students according to your requirements. Buying dissecting tools for an entire class or school? DR Instruments can save you even more – call us Toll Free: (888)-599-3442 for a special quote! Are you a reseller, such as a bookstore, cataloger, or other on-line business. Let us serve you as your supplier! 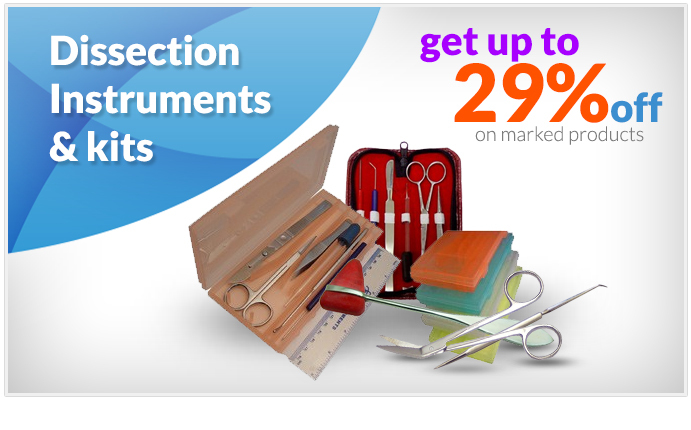 Get more information on wholesale dissection supplies.